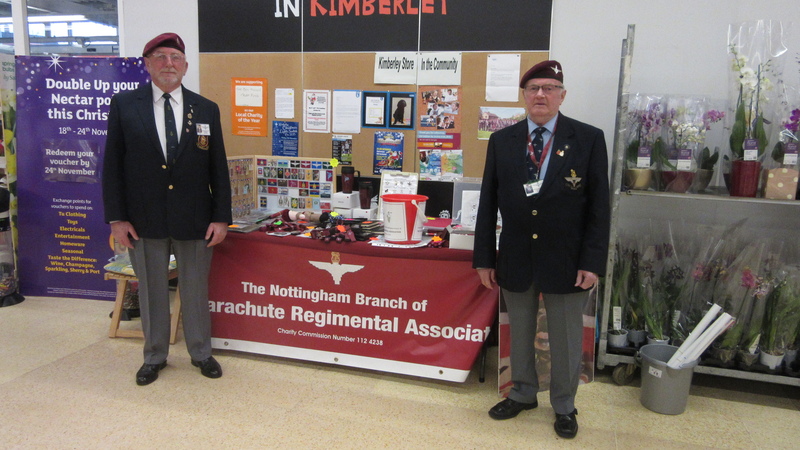 On Friday the 20th of November Branch members were back at Sainsbury's Kimberley at the invite of Angela Sheldon the Community Embassador for the store. 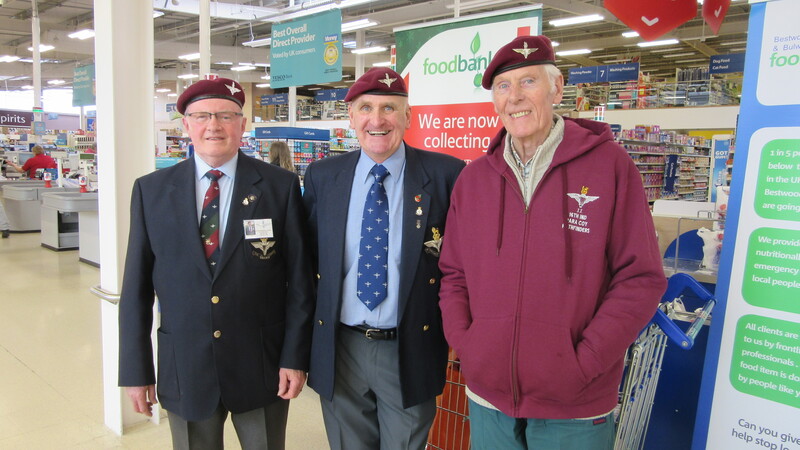 eight Branch members took part in the collection over the day, including: Derek Smith, Bill Marshall, George Worthington, Chris Gunn, Ken Sellars, Tom Twigger, John Needham and Mark Holding. By the end of day they had collected £274.82. A big thanks go out to all the staff and customers that supported us over the day, and for their continued support over the years. Above Left: Bill Marshall and Derek Smith during the 1st Shift. Above Left: Tom Twigger at the end of shift 3 with John Needham shift 4. 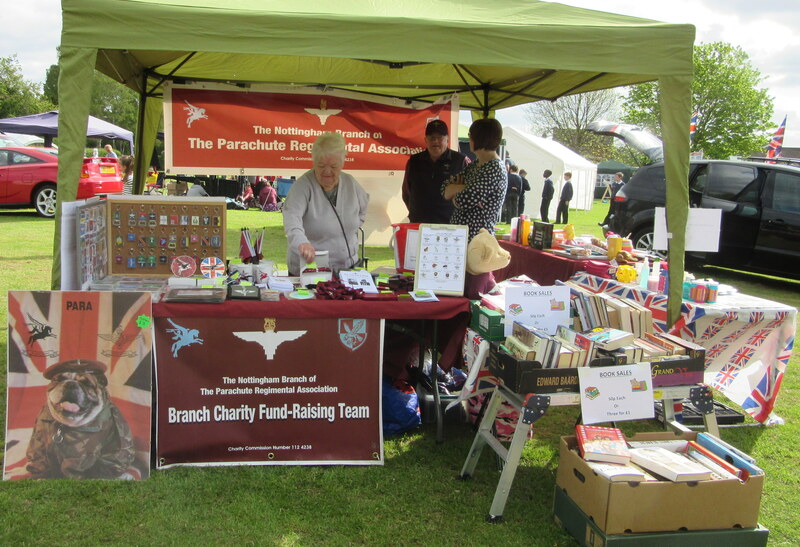 On Saturday the 10th of October Branch members John and Anne Needham and Mark and Kay Holding set up the merchandise table at the Midlands Regional Gala Weekend to raise funds for the Midlands Region of the Parachute Regimental Association. 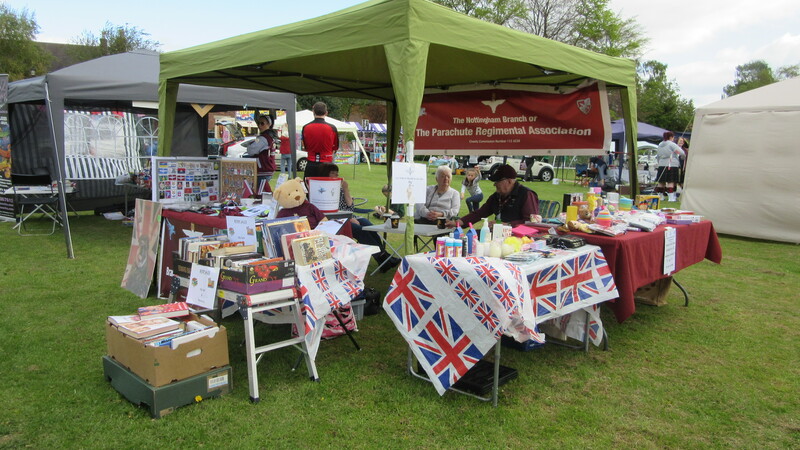 They set up in the early afternoon and within a few hours had raised £386.00, of which £300.00 of this was donated to the Midlands Region. 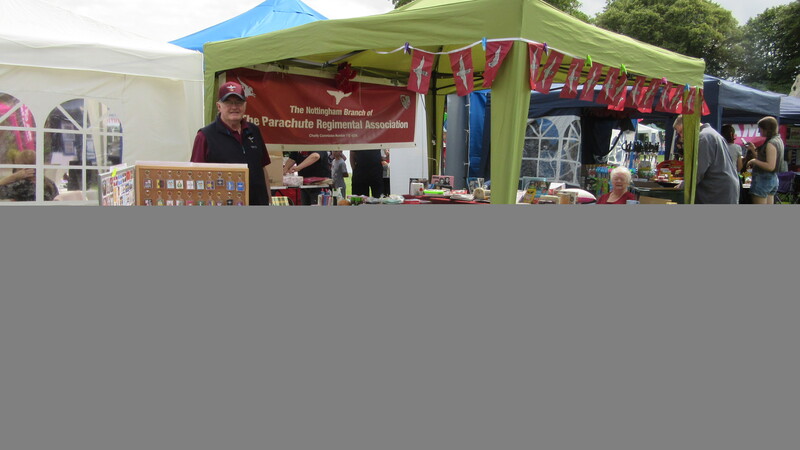 It is planned to do this each year to help support our Region of the Parachute Regimental Association. 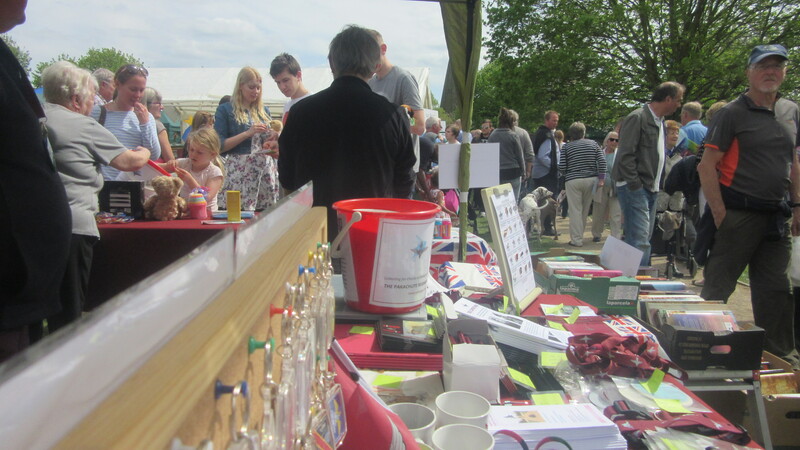 Above left: Kay Holding ready with the collection bucket at the tombola, and Right: John and Anne Needham. Branch members present were John and Anne Needham, Kay and Mark Holding, Bill and Meryl Marshall, Frank and Jean Wheatley, Caroline Bishop and Leanne Holding. 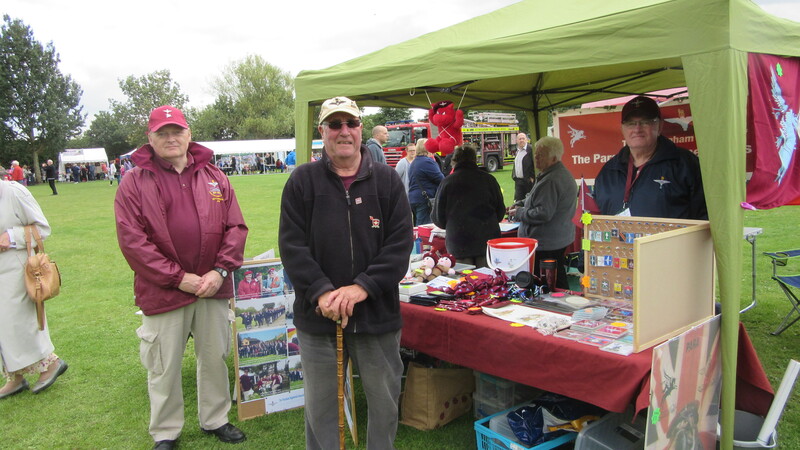 Above, Left to Right: Mark Holding, Frank Wheatley and John Needham at the Stapleford Carnival in September. 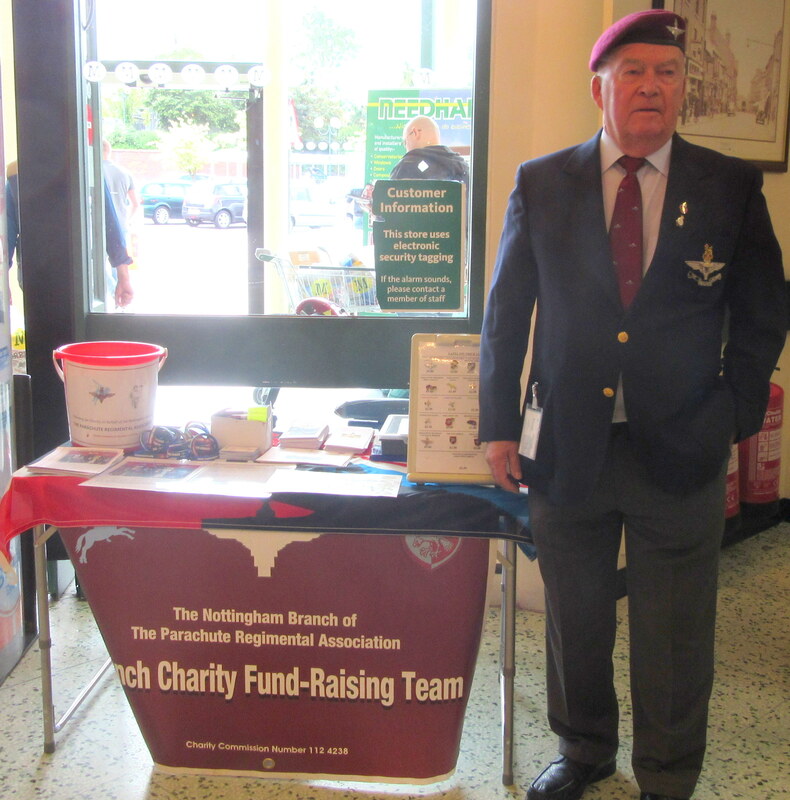 On Friday the 7th and Saturday the 8th of August, Branch members were once again out on another fundraising event at Morrisons in Bulwell. We had tried to get the support of this supermarket for the past five years, and this year was our lucky year. Our charity co-ordinator, Ken Sellars liased with Alicia Doyle (community champion) in March, who gave us the two days that we could stand. In the mean time, Alicia was promoted to manager, and we came under the supervision of Jodie Kirkham, who was happy to hoste us over the two days. Branch members in attendance were; Derek Smith, Ken Sellars, Frank Wheatley, George Worthington, Bill Marshall, Stan Hopkins, John Needham and Mark Holding. We have always had positive feedback from members of the public, and Morrisons Bulwell was no exception. 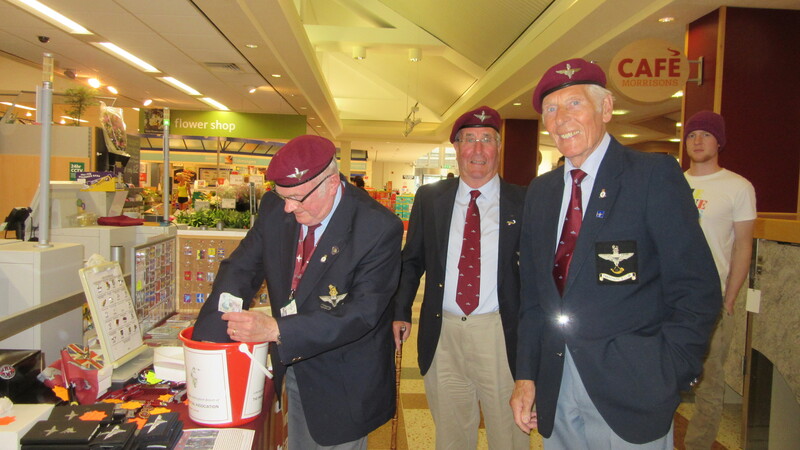 They were also very generous, as some members of the public donated £20. Friday was a very good day, as far as the usual collections go, raising £477.80. Thinking that this could not be improved, we then went on to raise and amazing £505.58 on the Saturday, bringing the two days total to £983.38, which is quite amazing. Morrisons have always been some of our best collection venues. 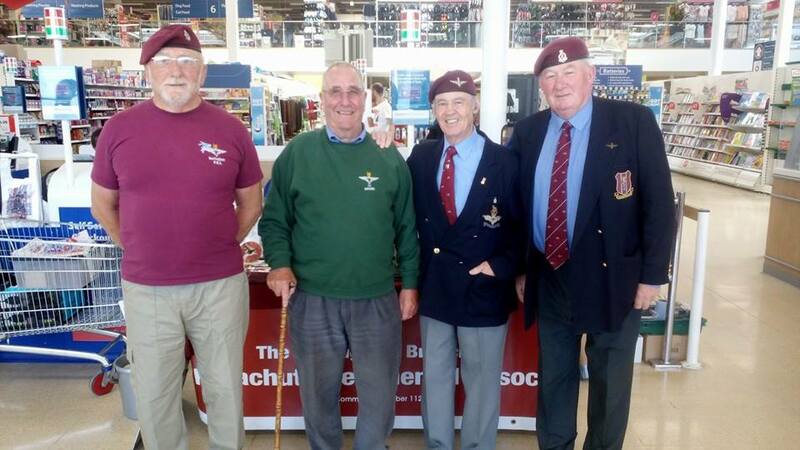 Thank to all the customers of Morrisons bulwell, and to all the staff for their friendly approach to our members over the weekend. We hope to see them again soon. Left: John Needham, Frank Wheatley and Stan Hopkins. Centre: Derek Smith, Jean Wheatley and Ken Sellars. Right: Stan and Margaret Hopkins. 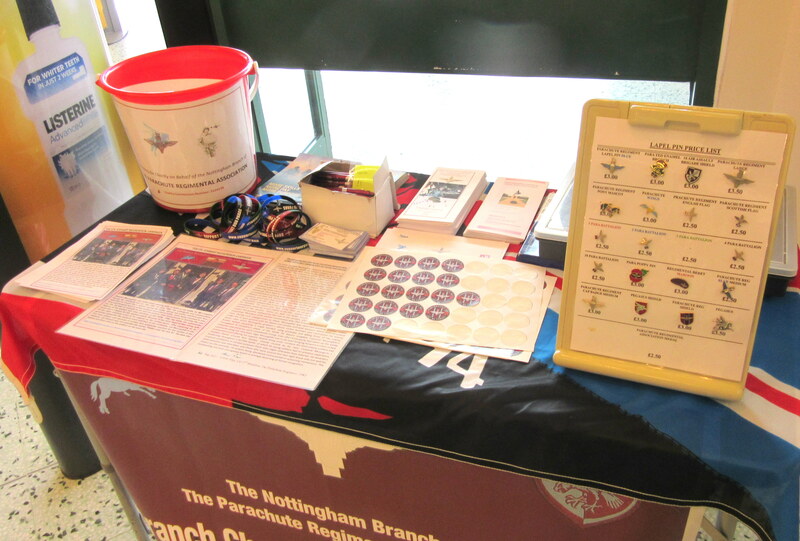 Sunday 12th of July was another day out collecting for the Nottingham Branch of the PRA. 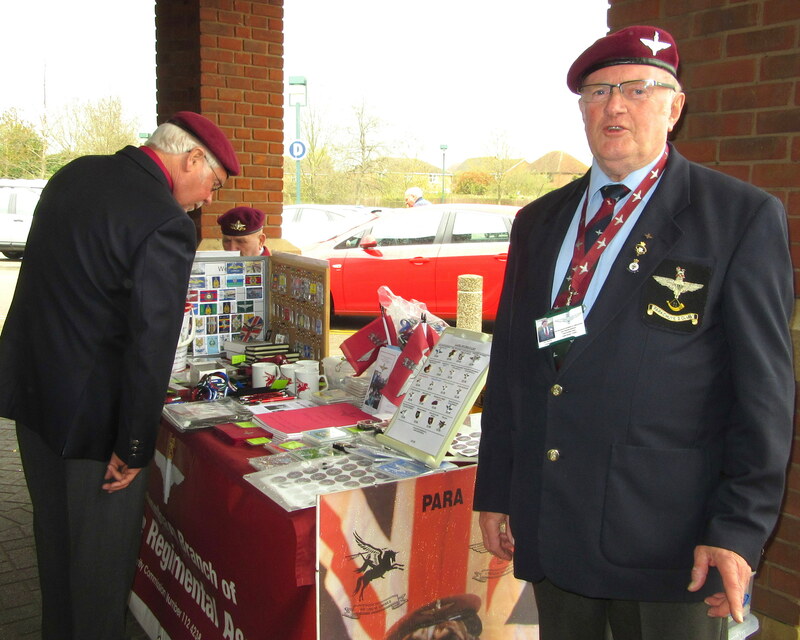 We had a smaller set up than usual, which included Support our Paras wrist bands, Lapel pins and Parachute Regiment pens. 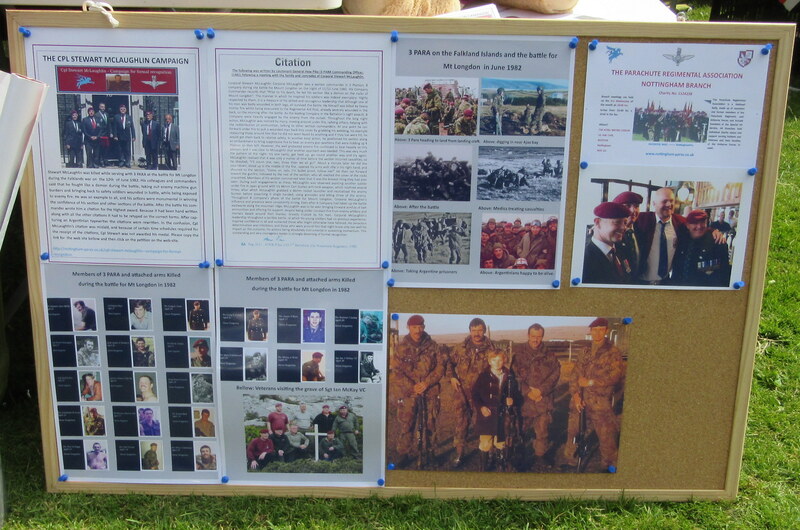 We also advertised the Branch and Support our Paras with leaflets and had information about the Stewart McLaughlin campaign, along with flyers. 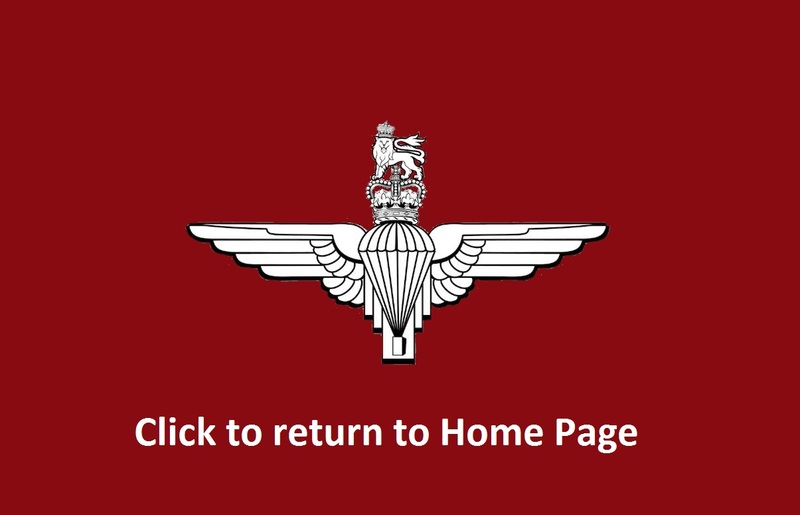 We even have advertising information for our local Airborne Reserve Unit, 144 Parachute Medical Squadron, Nottingham Detachment, and were able to point a couple of hopefulls into service. Between 10:00 hrs and 16:00 hrs, we distributed around 90 leaflets for the Stewart McLaughlin campaign. Members present during the day were: Derek Smith, Mark Holding, Ken Sellars and John Needham. A big thanks to all members of staff at Morrisons and to all members of the public for all their support during the day. 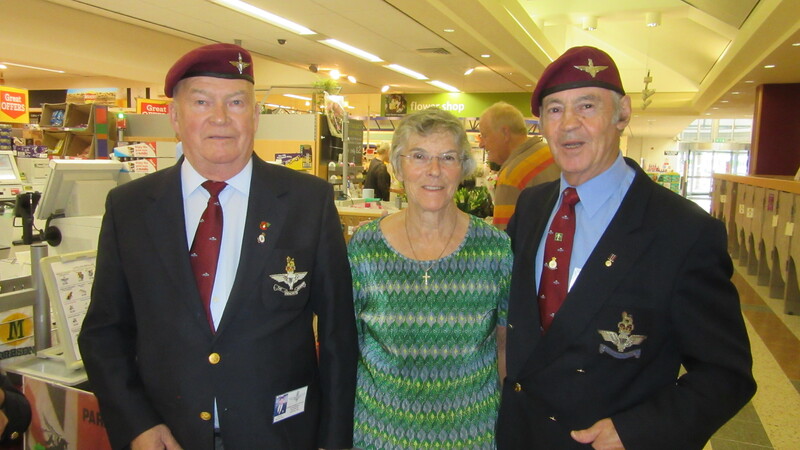 We were also able to inform a couple of former Airborne Warriors of our next meeting on Wednesday 15th of July. Above: Left and Cente, Derek Smith at the stand. Above: Right, The table set up was smaller than usual. Thanks to all members of the public for their support. We also drew the name the bear competition, which was won by Dave Hibbert, a former commando, who now works for a great local veterans charity in Beeston called Forces in the Community, run by Ricky Harrington, who is very hands on, and has helped many veterans gain work, housing, and help with a selection of problems that occur in the veterans community. A big thank you to Geoff Eklund for helping get more money in for the name the bear competition above. Geoff also works for Forces in the community, and is a former Medic. 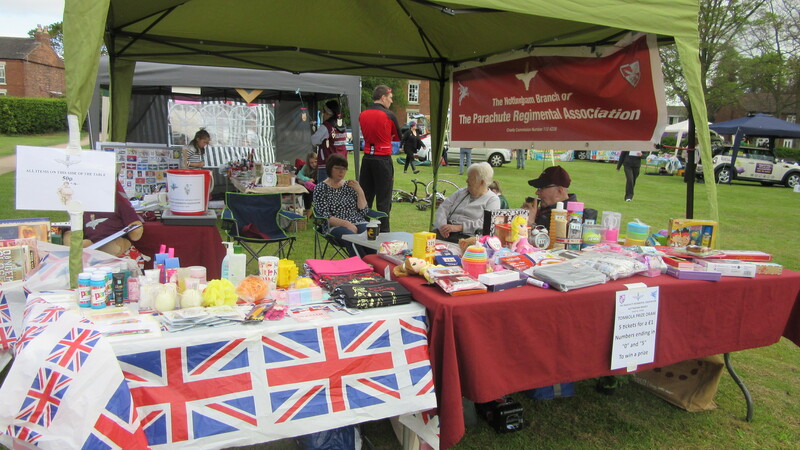 Finally to Anne Needham, and Kay Holding, who are always at our events selling tombola and other sales. Today they raised £139.50 of the days income, and have raised over £5000 from tombola, raffle and sales over the last four or five years. On Friday 12th of June the Treasurer of the Nottingham Branch received a cheque for £416.87 from Stuart Mather of Capital One in Nottingham. This Company has been most generouse to the Nottingham Branch over the last few years. One of their employees has been an honorary member of the Nottingham Branch for about the last four years and thanks to a charitable community scheme that Capital One run, which donates money to charities where their employee's help out, they have donated £416.87, which is part of their £ 4 £ for scheme for the time when their employee Richard O'Hara (Honorary Branch Member) helped us at our Morrisons collection at Gamston on Friday 10th of April. On behalf of the Nottingham Branch I would like to thank Stuart Mather of Capital One and Richard O'Hara for all their support and generous donations. Saturday Afternoon Left to Right: Tom Twigger, Frank Wheatley, Ken Sellars, Brian Williams. 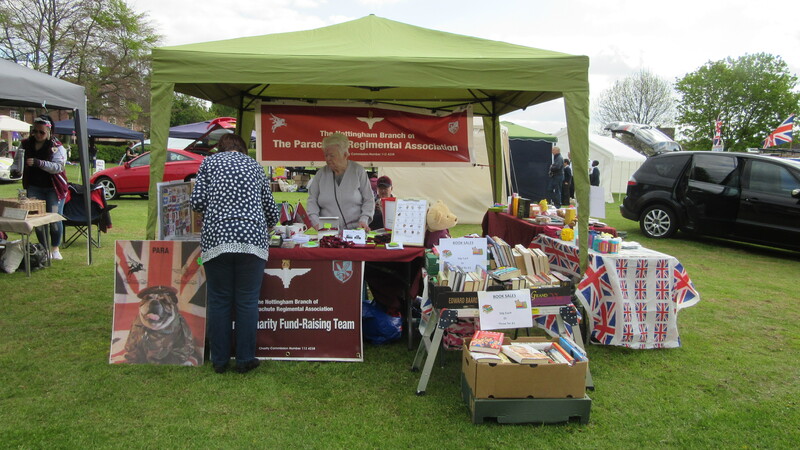 Branch members were today 4th May 2015, out on the ground again at the Breaston Bank Holiday Carnival. We started to set up from 08:45 and the gates opened to the public from 11:00. From then on the carnival ground was crowded right up until around 15:30, when things started slowing down a bit. By 16:00 we were packing away again. Branch helpers on the day were John and Anne Needham, Caroline Bishop, Bill Marshall and Mark and Kay Holding. 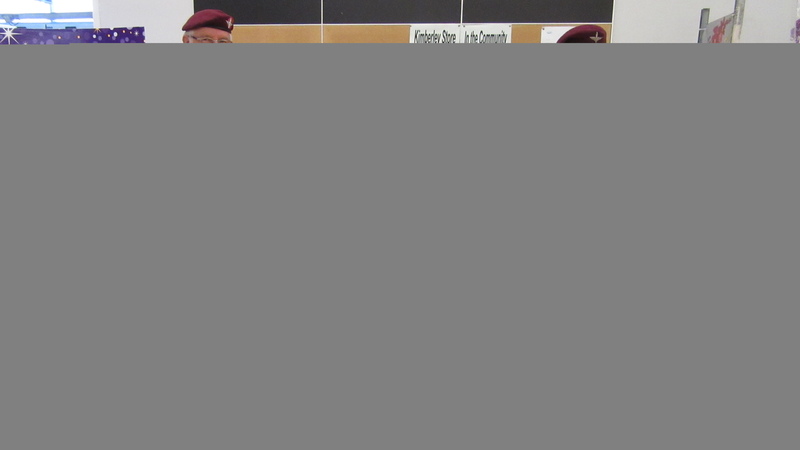 We met around six potential Branch members on the day, all were either serving, or ex 3 PARA , with one from 7 PARA RHA, and information was handed out to all potential members. The final total for the day, including tombola, merchandise and book sales and name the bear competition came to £274.40. 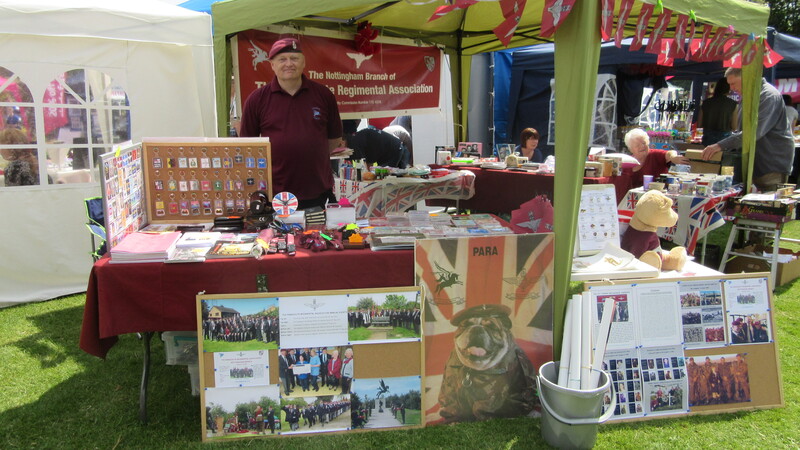 We now look forward to planning next years event, and look forward to Armed Forces Weekend at Wollaton Park on Saturday 27th and Sunday 28th of June. 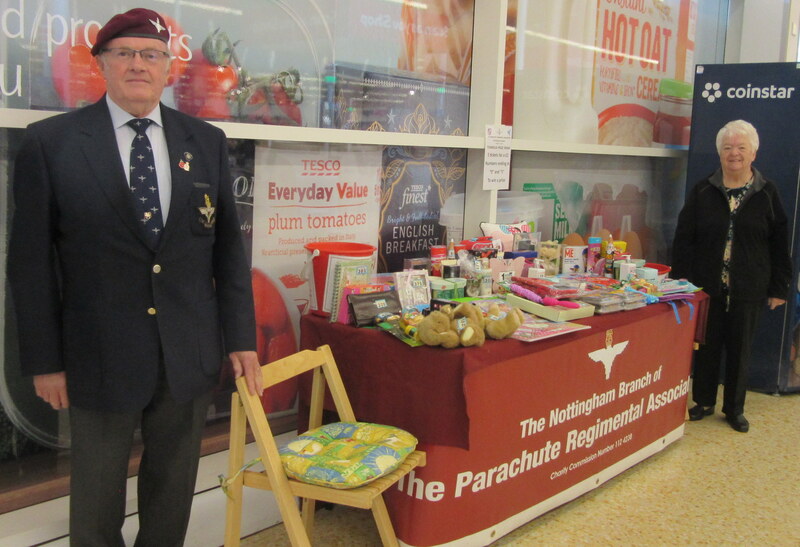 On Saturday 25th of April the Nottingham Branch had been invited to set up a tombola event to raise money for the charity. 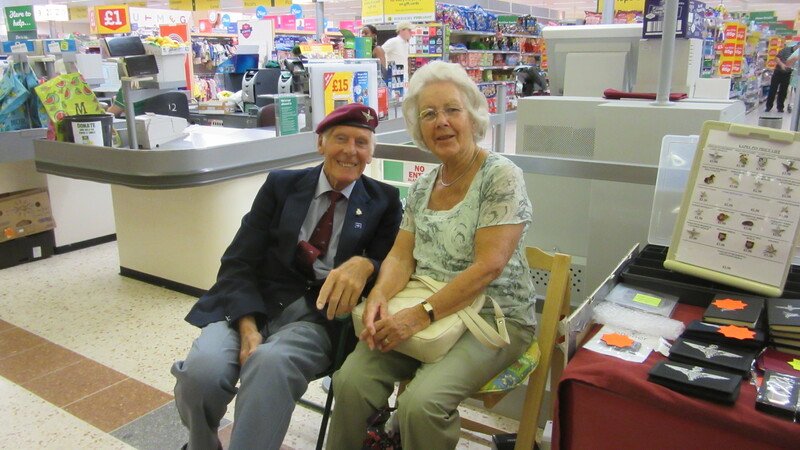 At 09:00 hrs Mark and Kay Holding set up the table and tombola prizes and continued to sell tickets to the customers of Tesco. At around 10:45 John and Anne Needham arrived to help out. During the day they worked on a shift system, and by 15:45 hrs the day came to an end. The grand total for just over six hours work was £252.55. 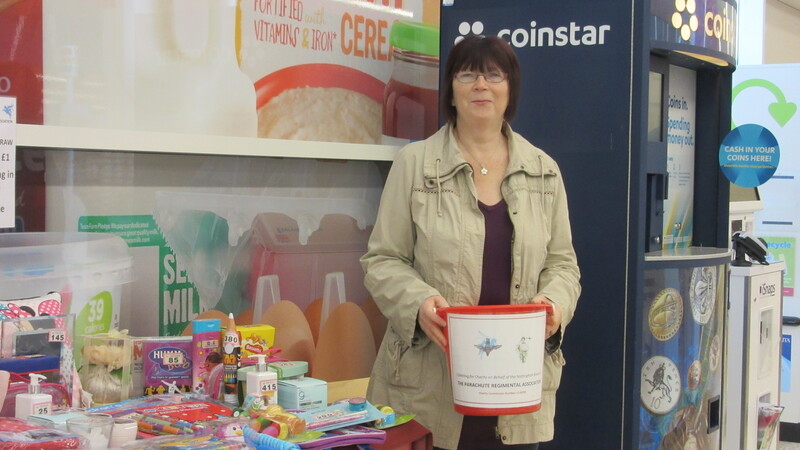 We would like to thank Tracie Basra, the community champion of Tesco Toton for allowing us to stand during the day. Many thanks to all customers that helped support us by buying tickets. 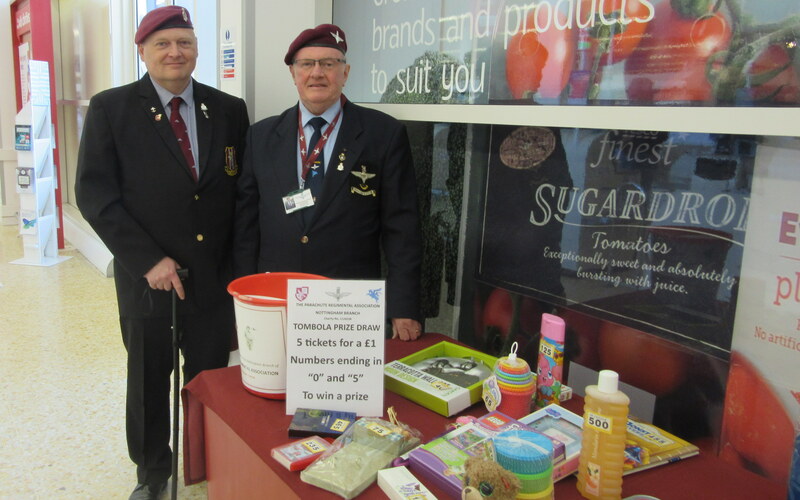 Below: Left: Mark Holding and John Needham at the tombola event during the afternoon. On Saturday 18th of April 2015 Nottingham Branch hosted the Hogs Head Hotel carvery and social event which included members from Branches from: Derby, Newark, Lincoln, Leicester, Chesterfield and Sheffield. 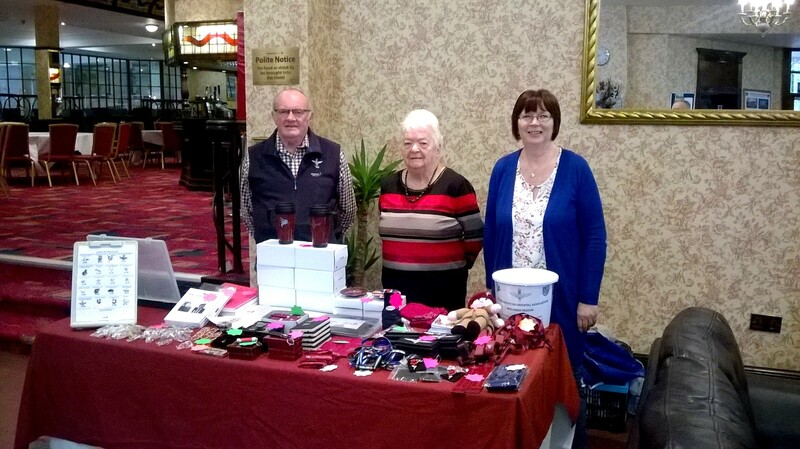 During the afternoon and after the carvery dinner, Branch wives; Kay Holding, Anne Needham, Caroline Bishop and Meryll Marshall sold tombola tickets and merchandise. This raised an amazing £200. The rest of the day was spent socialising and having group photos. The Branch looks forward to next years event. Below: The group photo showing PRA members in the afternoon. 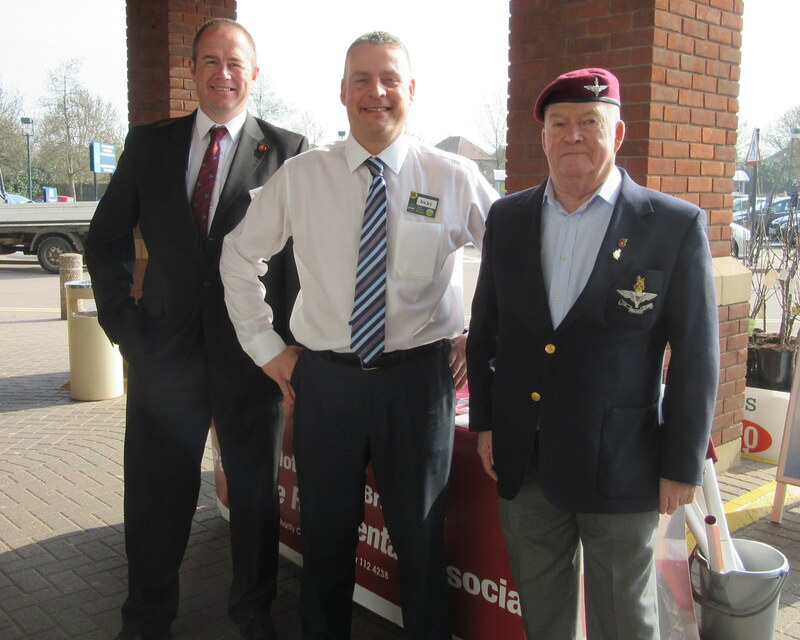 On Friday 10th of April Nottingham Branch were out to the East of Nottingham at Morrisons superstore, Gamston. The last time that we had a fund raising event at this store had been two years previously, and from member, had been a good event. Derek Smith and Mark Holding set up first thing, and were joined by Richard O'Hara, who as one of our charity co-ordinators had secured this store a couple of months earlier. The staff and customers had been very friendly and generous, and by the end of the day had raised £416.87. .Below left: Richar O'Hara, Store Manager Andy Wall and Derek Smith during the first shift. Below left: Bill Marshall, George Worthington and John Needham during the afternoon shift. 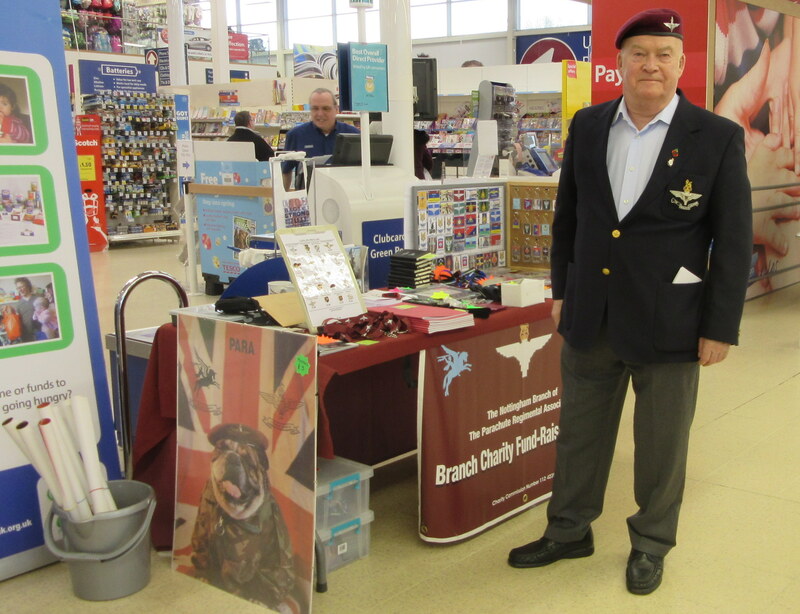 Friday 20th and Saturday 21st saw the Branch standing at Tesco Bulwell. It had been decided at the previous meeting that all proceeds from this two days would go to the Hayward House Hospice for paliative care. Our Secretary, Mick O'Connor works part time for the unit and is planning to cover 1000 miles walking over the year. In May he is walking the coast to coast walk, and we pledged £500 to sponsor him on the coast to coast walk as well. Over the two days members raised £511.13, which will be added to the £500 already pledged to the cause. The Branch thanks Chirs Tilley, community champion of the store for his continued support and all customers and staff that supported us over the two days. Below: Derek Smith just after setup on the Friday morning. Below left: John Needham, Mick O'Connor and Stan Hopkins during the afternoon shift. 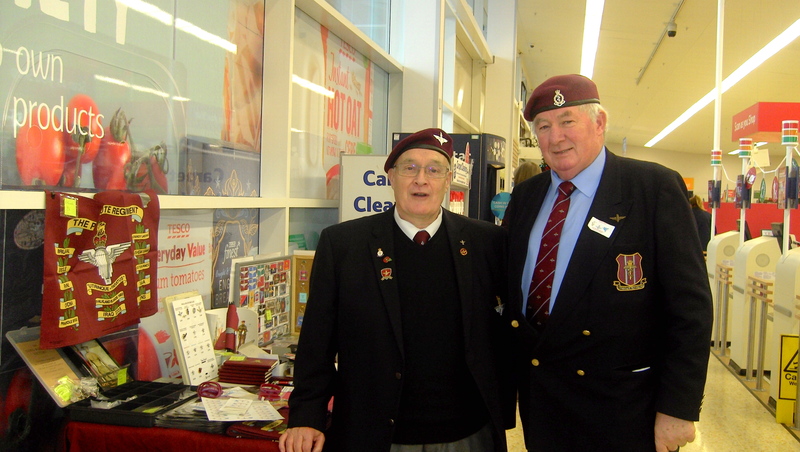 Below left: Derek Smith and Mark Holding just after setup at Beeston Tesco on the Saturday morning. 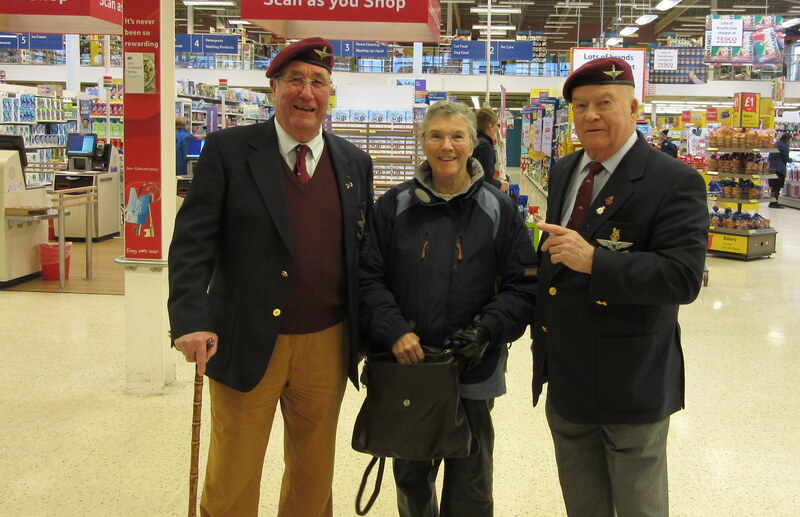 I Below left: Frank Wheatley, Jean Wheatley and Derek Smith at Tesco Beeston during Saturday morning. 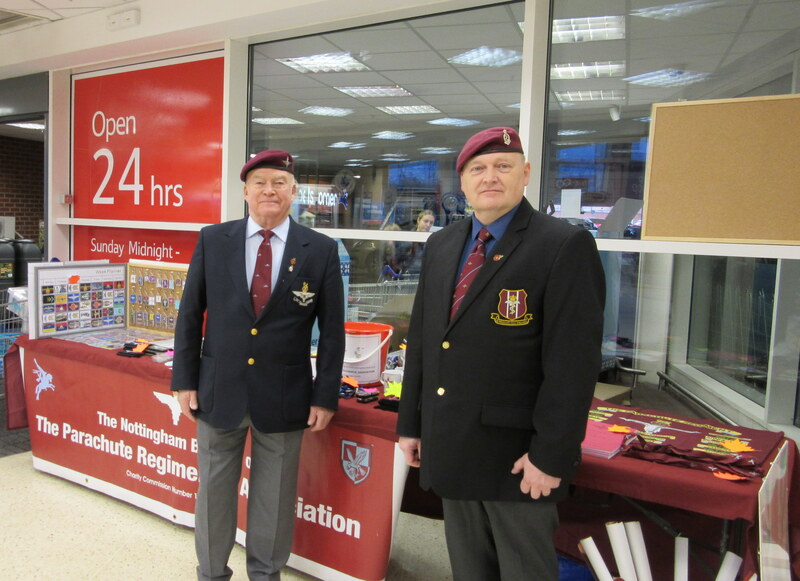 Leading upto Christmas the Branch were out at Tesco Long Eaton on Friday the 5th and Saturday 6th of December. We were able to set up a large setup with two six foot tables, showing our big display of merchandise. Thanks to a good team of members, we were able to cover the two days without any problems. After the Saturday collection Branch members would be on their way to Derby PRA for the Derby Branch Christmas dinner. During the two days we were able to raise an amazing £847.97, and we thank all the staff and customers for all their support over the two days. During the two days Branch members included; John Needham, Ken Sellars, Chris Gunn, Colin and Kevin Key, Brian Williams, Bill Marshall, Derek Smith and Geoarge Worthington. Left: Chris Gunn and Mark Holding during the Saturday afternoon. 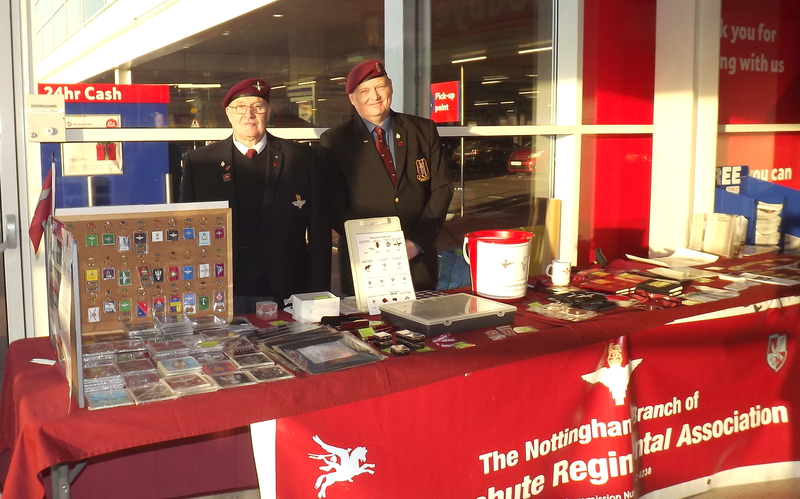 On Thursday the 4th of December Nottingham Branch were once again standing at Tesco Superstore at Toton. 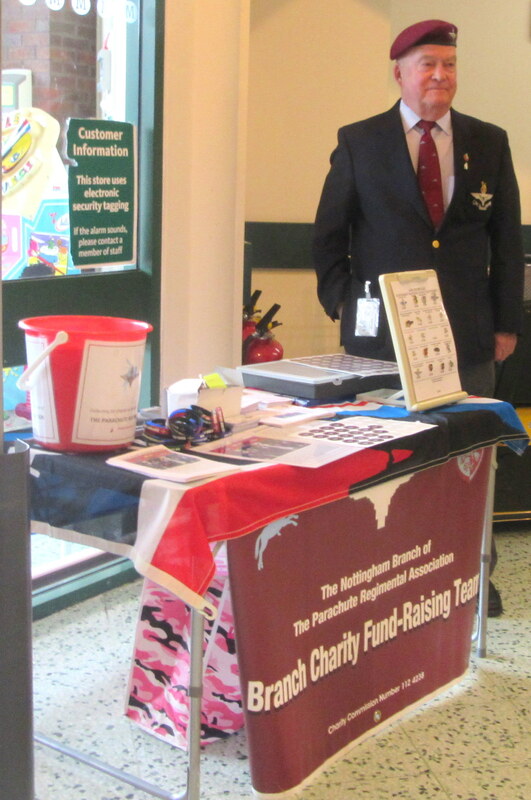 By the end of day members had been able to raise £264.98 through merchandise sales and donations received. The Branch would like to thank the staff and customers for all their support. John Needham and Derek Smith covered the 1st shift and can be seen on the photo above. 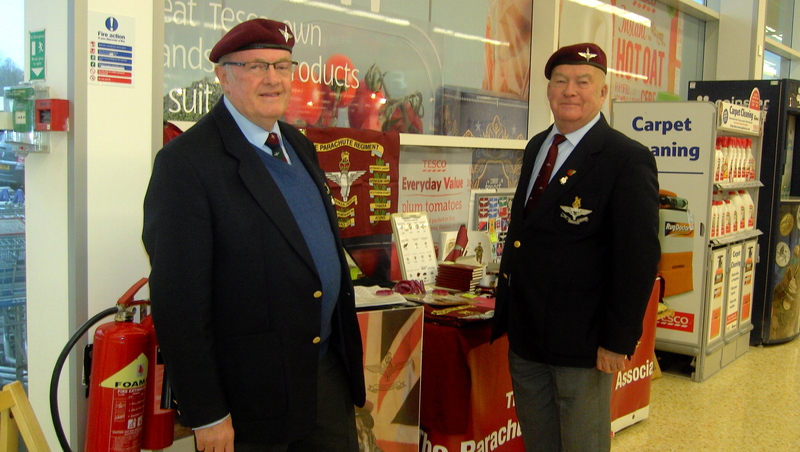 During the Afternoon Chris Gunn and Brian Williams were on hand to support the stand and can be seen on the picture below. Below left: John Needham and Derek Smith in the morning. Right: Chris Gunn and Brian Williams in the afternoon.